Giants president of baseball operations Farhan Zaidi discussed his team’s outfield situation in the wake of the team’s failed pursuit of Bryce Harper. As John Shea of the San Francisco Chronicle reports, Zaidi won’t be rushing out in search of a replacement star. The Giants’ pursuit of Harper, while clearly genuine, was not premised upon a need to boost the 2019 roster. The club hopes to be competitive in the coming season — Zaidi reiterated the point again today — but obviously also understands it isn’t terribly likely to field a playoff team. Having missed out, Zaidi says, “the Plan B really takes place over 12 years, not just a couple of days.” In the near-term, the club will be able to engage in “continued pursuit of some guys in the trade or free-agent market [that] probably would’ve been precluded” in the event of a Harper deal. What might the club be looking for? The preference is for a right-handed hitter, says Zaidi, perhaps reflecting the fact that both Steven Duggar and Gerardo Parra appear likely to crack the roster as left-handed-hitting outfield pieces. Veteran free agent Adam Jones makes some potential sense, though Zaidi says that trade scenarios appear more likely at this point. Guessing at trade targets is difficult, since roster battles are still taking shape and other moves could drive the final decisions. Zaidi says he anticipates exploring roster changes right up through the end of camp, so it seems he’s ready to wait out the market if needed. 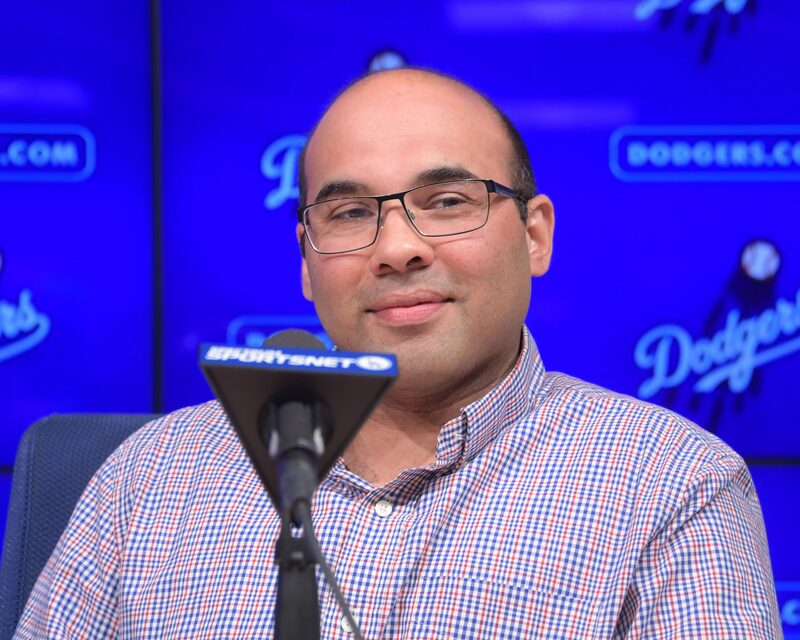 The answer in San Francisco continues to be “not much” as fans await a splashy move from new president of baseball ops Farhan Zaidi, per Al Saracevic of the San Francisco Chronicle. It’s not all doom-and-gloom for Giants fans, some of whom are holding out hope for a Harper signing. Harper continues to make sense for the Giants, who lack established bats in the outfield, but signing him would be a quick pivot for Zaidi, who has preached patience in the early going. Of course, Harper is a unique case. If he ends up with the Giants, fans will certainly have something to be excited about, and if he doesn’t, they can at least look forward to reaping the long-term benefits of Zaidi’s prudence. Franklin Barreto began a new endeavor in his career with five innings in left field yesterday. The starting second base job belongs to Jurickson Profar for now, and it appears as if the bench role will go to Chad Pinder, per MLB.com’s Jane Lee. Barreto was the A’s top prospect per Baseball America in both 2016 and 2017, but after struggling through two short stints in the majors the last two seasons, Barreto’s future in Oakland is muddled. Jed Lowrie’s free agency seemed an opportunity for Barreto to stake his claim to the keystone, but the Profar acquisition thrust Barreto back into limbo. He’ll be 23 this season, slated to begin the year R Triple A where’s he has played most of the last three seasons. Barreto has only one option year remaining, making 2019 a make-or-break year. Pinder, meanwhile, has three option years remaining, but established his value to the big league club last season by hitting .258/.332/.436 while appearing at every position except pitcher and catcher. First-year Giants President of Baseball Ops Farhan Zaidi isn’t feeling the pressure of the offseason quite yet, in part because the offseason action has shifted later and later into the winter. Zaidi doesn’t care to comment publicly about any specific trade talks or which free agents the team might be targeting, but he knows the San Francisco fanbase is growing restless, per Henry Schulman of the San Francisco Chronicle. Madison Bumgarner remains their biggest trade chip, but assuming the World Series hero stays in the Bay, relievers Tony Watson and Will Smith have drawn the most interest around the league. Still, their new President is in no rush to jump the market. Despite coming to SF from LA, Zaidi is a small market strategist who spent his first ten years in the game with Oakland before working under long-time Rays’ GM Andrew Friedman. Large market teams like SF and LA have poached front office personnel from smaller markets in part to better avoid the exact type of splashy free agent signing that fans crave. All signs point to Zaidi bringing the Dodger model to the Bay – which isn’t huge payrolls and headline free agents – it’s creative, innovative “small market” thinking first, and dipping into the reserves of their large market second. The Milwaukee Brewers are fairly confident that offseason signee Cory Spangenberg has room to grow in a couple areas of his game, per Tom Haudricourt of the Milwaukee Journal Sentinel. GM David Stearns sees some unrealized power potential in the 6’0″ infielder, but the more actionable area of growth for Spangenberg is his versatility. He mostly played second base and third base as a Padre, with occasional spurts in the outfield (in 2017, he got 25 starts in left field). Stearns sees Spangenberg continuing with outfield work, as well as picking up some time at shortstop in the spring. Defensive metrics haven’t raved about Spangenberg’s work at any position, but even if he’s only a passably below-average defender, there’s something to be said for being passably below-average all over the diamond. The hallways at Orioles HQ aren’t exactly bustling with activity, but the analytics, coaching and front office teams are beginning to fill out. With less than six weeks before the opening of Spring Training, GM Mike Elias is comfortable being in the early stages of building, shaping and refining those departments. Nonetheless, Baltimore’s front office team is – in the fateful parlance of the Emperor – fully armed and operational, per Jon Meoli of the Baltimore Sun. After clearing out much of the staff both before and after the hiring of Elias, those remaining staffers have been given more responsibility until key vacancies are filled. Koby Perez takes over one of those key roles as the new senior director of international scouting, a position with greater import in Baltimore than perhaps any other organization in the league, as his responsibilities include the management of their robust international bonus pool money. Though they have until June 15th to spend that money, Elias and Perez recognize that the international scouting process is typically a years-long, not a months-long process, per MLB.com’s Joe Trezza, and they are in no rush to spend to the limit. Though they can spend close to $6MM in that area, they are by no means required to, and there are many areas internally where that sum of money could be put to use.